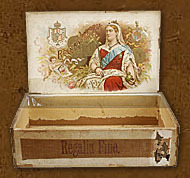 George V—occupied the English throne during the cigar box’s Golden Era, and figure prominently on box labels. Queen Victoria at the height of her power. Likely issued in honour of her Golden Jubilee, 20–21 June 1887, marking the 50th year of her reign. King Edward VII, who reigned from 1901 to 1910, was the last English monarch for whom an age was named—perhaps because he was the last with such unrestrained appetites. Edward loved women, fine dining, shooting, gambling, tobacco—he consumed 12 large cigars plus 20 cigarettes a day—and horse racing. He is said to have sent his horse, Persimmon, Christmas cards; horses from his stables won the Derby three times. 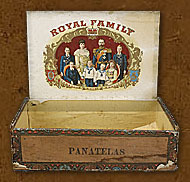 An older label by the venerable lithographer, Rolph and Clark (1904–1917), on a newer box (1935 or later). J. Hirsch & Sons, Montreal, Que. Montreal cigar maker J. Hirsch & Sons produced a series of three tins in 1911 commemorating the coronation of King George V, son of Edward VII and grandson of Queen Victoria. The future King Edward VIII would abdicate his throne in 1936, after a reign of less than a year, to marry American divorcée Wallis Simpson. Prince Arthur, Duke of Connaught (1850–1942), third son of Queen Victoria, served as Governor General of Canada, 1911–1916. One contemporary and two future kings of England look out at the cigar buyer: George V (reigned 1910–1936); beside him, eldest son Edward (reigned and abdicated as Edward VIII, 1936); and beside Queen Mary, second son Albert (reigned as George VI, 1936–1952). The other children (l-r): Henry, George, John, and Mary. Neither George V nor George VI grew up expecting to be king: George V’s elder brother died of pneumonia; George VI’s abdicated. Wm. Kelly & Sons, London, Ont. 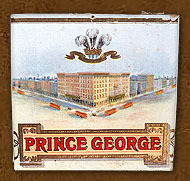 The arms of George, Prince of Wales (later George V), adorns an image of his namesake hotel on York Street in Toronto, Ontario (1910–1969).